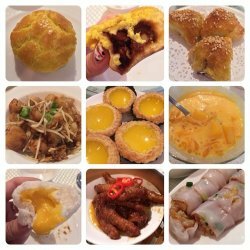 I’ve heard many positive reviews on Wah Lok’s dim sum and finally had the time to check it out. This is my first time at Carlton Hotel and I was impressed by the spacious lobby, featuring an eye-catching chandelier made out of blown glass. The grand entrance of the restaurant. I noticed numerous awards are display on the right; this upped my anticipation. Wah Lok’s decor is sophisticated, with Oriental architecture features and motifs. Tables are spaced comfortably apart. Service is brisk and helpful. 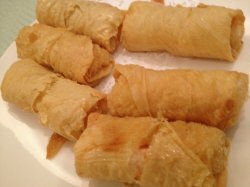 Unlike most restaurants that offer their dim sum in portions of 3, Wah Lok accommodated our request for 4 portions. No need to cut (and at the same time ruin) the dim sum for sharing. Fantastic! No comments about the dish indicates I find it passable. I’ll elaborate further on the notable items, and also those I find lacklustre. Wah Lok has a fixed soup of the day from Mondays to Saturdays. On Sundays, it varies. On this particular Sunday, it was Shark’s Fin Melon Soup ($7.50), aka 鱼翅瓜 soup. Don’t worry, no sharks were used to prepare this. The main ingredient is a type of melon, which got its name from its resemblance to shark’s fin. The texture of the melon is beautiful- juicy and soft noodle-like strands. Slurping up the melon and fortifying soup was a joy! The Roasted Pork ($12) had enticing crackling skin, but the flesh itself was a tad dry and not as melt-in-the-mouth as expected. 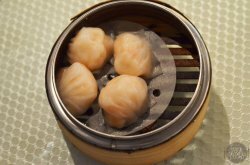 Large Steamed Prawn Dumplings ($6.80/4 pcs) came with shimmery translucent skin which held the fresh, crunchy prawns very well. The Steamed Pork Dumplings ($6/4 pcs) was another well-executed classic. Nice bouncy texture with great flavours from the fresh pork and mushroom. Century Egg with Pork Congee ($6.80) and Pig Liver Congee ($6.80). Portions were small for the price. Deep fried Beancurd Skin Rolls with Shrimps($9.20) and Deep Fried Prawn Dumplings ($6/4 pcs) were delightfully crispy and not at all oily. The Steamed Custard and Egg Yolk Buns ($4.80) were having a bad day; they failed to flow. 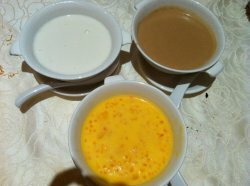 The custard was too sweet as well, overshadowing the salted egg yolk flavour. Deep Fried Crabmeat and Scallop Balls with Chilli Sauce ($10). What a convenient and fuss-free way to enjoy chilli crab, made even better with succulent scallops. The gravy is truly highlight here- addictively spicy and tasty. 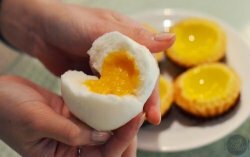 The Baked Mini Egg Tarts ($6/4 pcs) could do with a more flaky and buttery pastry. We rounded off the excellent lunch with appealing desserts- Cold Aloe Vera with Lemongrass ($6) and Chilled Green Apple Jelly with Chrysanthemum ($6). While prices may be a bit steep for Wah Lok, the quality, execution, ambiance and service makes it worthwhile. Dropped by my favourite dim sum place, Wah Lok, with my friends one weekday afternoon for a leisurely lunch. We had the suckling pig and BBQ pork combination and it honestly wasn't a very good start to our meal. The BBQ pork sported a beautiful sheen but lacked bite whilst the suckling pig had a nice crisp skin to it but came across as overwhelmingly oily. The 烧卖 had a rather low fat to meat ratio thus didn't come across as too overwhelming. Pretty good. A crisp but a wee bit too oily exterior packed with crunchy prawns. Best eaten hot! Now this wasn't quite impressive. 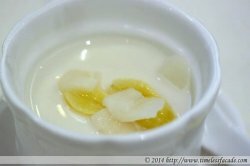 The flowing custard lacked the saltiness and texture of egg yolk. It was just plain sweet honestly. Fresh tasting, crunchy prawns all bundled up in a thin, semi translucent skin. What's not to like? This tasted rather similar to the steamed prawn dumplings except that it was filled with crab paste instead of prawns and wrapped up in a mildly stretchable, semi translucent skin. Pretty decent. 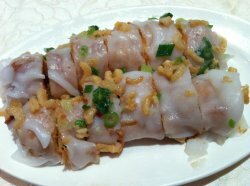 Another dim sum staple, the BBQ pork cheong fun boasted silky smooth skin with generous servings of BBQ pork within, all sitting in a pool of light soya sauce. Nice! The steamed carrot cake honestly didn't look like much but it came across as smooth, moist and encrusted with savoury dried shrimps. Simple yet nice! One of the signature dishes of Wah Lok, the baked BBQ pork bun ranks a close third behind that of Tim Ho Wan and Lung King Heen (top of my chart) in my humble opinion. Sporting a darker than usual colour probably due to a slight overbaking, the bun had a nice crusty top with mildly viscous, semi sweet pork filling encased in soft dough. Exhibiting a nice sheen on the crust, the abalone and chicken pie was wonderfully buttery with generous bits of moist chicken and abalone cocooned within. It was so good that we had 2 servings! Quivery, not too sweet custard center on a flaky tart base. Pretty good but the tart could do with a little more butter in my humble opinion. One of my must order dishes whenever I visit Wah Lok, the baked custard pasty (美人腰) was as good as my previous visit. 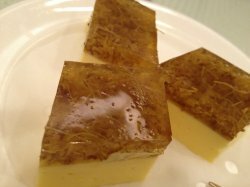 "Lithe" and flaky with a smooth and sweetly satisfying custard filling. To round up our largely excellent lunch, I had the homemade soya beancurd with gingko nut and chestnut. Though smooth, it honestly wasn't my cup of tea due to the amount of gelatin in it. I personally prefer the silky smooth, soft type. I did like the crunchiness from the chestnuts though. The 3 of us racked up a bill of over $150 for a pretty satisfying meal, in terms of quality and quantity. Wah Lok has been very consistent over the years and I look forward to returning soon! 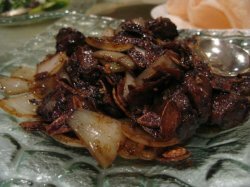 Wah Lok at Carlton Hotel is a familiar name for most food connoisseurs given its sterling track record and list of accolades to its name. Consistently ranked by Singapore Tatler Magazine within the list of "Singapore's Best Restaurants" and Wine & Dine for "Singapore's Top Restaurants", can it continue to impress its fine diners after all these years? 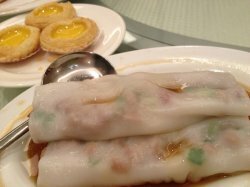 While most restaurants offer their dim sum in portions of three, Wah Lok was able to prepare four portions for each of the dim sum dishes. Personally, I felt that was nice gesture especially if you are playing host to business associates or simply a lunch gathering with a few friends. On hindsight, this was one of my favourite dim sum dishes at Wah Lok. 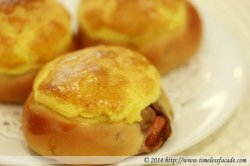 If you are a fan of baked char siew buns and polo buns, be sure to give this a shot. The crust of the polo bun was a beautiful crisp layer which complemented the overlying soft and fluffy bun. A subtle hint of sweetness stood out from the fragrant diced char siew, leaving us to crave for the next bite. 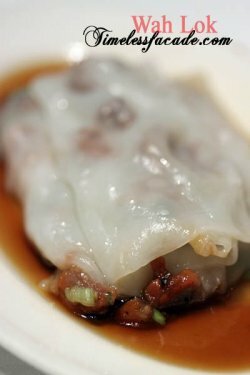 The true test to a dim sum chef lies in perfecting the classic dishes such as this or more commonly known as char siew sou. 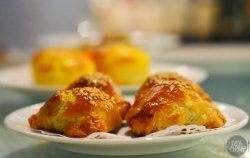 Beautifully baked with a coat of golden brown, the flaky pastry crumbled upon the first bite and the aroma of the char siew took centerstage almost immediately. Surely a must-try in my personal opinion. 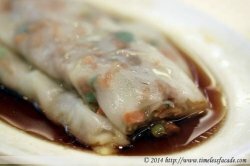 We enjoyed the juiciness and burst of freshness wrapped within the thin layer of dumpling skin. What I also liked was that subtle hint of natural sweetness that lingered. This was one of those classics done right that would instantly bring a smile to your face. All that needs to be done with the siew mai is to pop it into your mouth and enjoy the succulence of the pork dumpling coming through in a palatable manner. 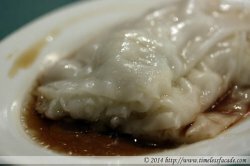 Like the har gao, there was a hint of natural sweetness from the fresh minced pork and reminiscing the flavours while writing was enough to make me salivate once more! When the dish was served, it was not quite what I had in mind but the large chunks of finely-grated radish made it one a palatable dish. Stir-fried and tossed with crunchy bean sprouts and fried shallots, we enjoyed the complementing layers of texture when tasted together with the soft and moist radish. Quite frankly, this was one of the few lacklustre dishes on the table. 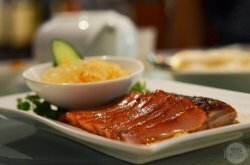 While the barbecued and honey-glazed char siew was prepared in a truly Cantonese fashion, I felt that it was too lean for me and as such failed to shine. The roast duck on the other hand tasted pedestrian as I would have preferred the skin to have a nice crisp while the meat to remain tender and moist. On this occasion, I felt that the duck breast was slightly too stiff for my liking. 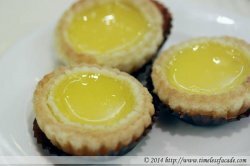 Always on the hunt for the best egg tart in Singapore, I felt that this certainly made it to our "must-try" list as the flaky pastry was almost melt-in-your-mouth while the fragrant egg custard sitting in the middle carried a desired level of sweetness to please. 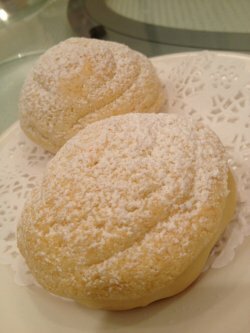 Leaving the best to the last, the steamed custard bun is almost a dessert itself with a rich and creamy filling. Like most of the other dishes, the sweetness that cut across my palate was comforting with its mildness. While I enjoyed the fluff of the bun, the layer was too thick for my liking. Despite the focus on dim sum, we also had a plate of greens, stir-fried kailan with garlic (S$16/++) which was cooked perfectly, allowing the kailan to retain succulence and crunch. Ending off on a sweet note, we had the herbal jelly (S$9/++) and cream of pomelo & mango (SS6/++) to share and both desserts hit the right notes to a sumptuous dim sum lunch. We enjoyed the ambience at Wah Lok as it reminded me fondly of a few classic Chinese restaurants such as Fook Lam Moon or Luk Yu Tea House in Hong Kong. 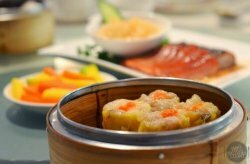 Hearing the service crew converse in Cantonese always gave that extra homely feeling and with the quality classic dim sum dishes served, it is a place which makes customers return. First impression wasn't too good when i first arrived at the reception area! The staff was shouting to the customer on the phone. It was a "oh my god" moment. Waited a while and was usher in to our table. 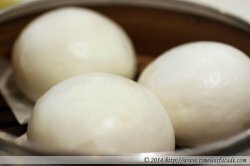 Po Lo Bun - Lovely skin texture for the buns and the char siew filling is nice and moist! Pretty well executed for this dish. 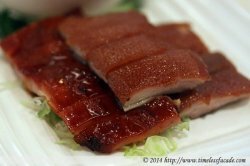 Char Siew Sou - I always love the flaky crisp texture of the skin + the char siew filling. The ones here didn't disappoint. Carrot Cake with XO Sauce - This one i remembered it was decent but i didn't eat much cause was busy chatting when it arrived on my table. 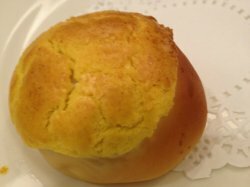 Custard Bun - Judging from my pictures, i don't have to give any caption or description at all. Haha! Just look at the oozing goodness coming from the bun. Chicken Feet - This is always a must order dish for dim sum! I like it enough to order a second serving. 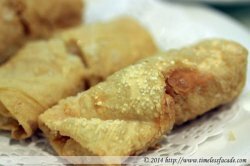 Zha Leong - Fried dough stick wrapped with chee cheong fan. Not everywhere has this but seems to be gradually getting more popular. I find this ok, no wow factor though. Decided to catch up with a couple of my ex colleagues over dim sum one Saturday afternoon @ Wah Lok. Reservations are recommended, especially for weekend dim sum as the place can be very popular and tables extend out towards the walkway leading up to the main dining areas of the restaurant. Steamed Carrot Cake -The carrot cake wasn't as smooth as I remembered it to be but I liked the bits of dried prawns atop which gave it flavour. Century Egg & Pork Porridge - Now, the porridge was rather disappointing. Stodgy and rather bland with bits of pork and century egg. No wonder there was leftovers. Steamed Crab Meat Dumplings - This was pretty decent with the skin translucently thin and chock full of crab meat paste. But to be honest, it tasted pretty similar to the steamed prawn dumplings so I'm not too sure if its worth the slight price premium. 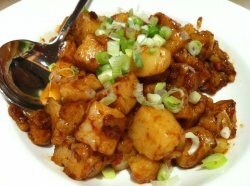 Steamed Scallop Cheong Fun -Silky smooth cheong fun coupled with sizeable bits of scallops, what's not to like? Well, more scallops would always be welcomed. Deep Fried Prawn Dumpling - The deep friend prawn dumplings came a nice crisp shell that didn't carry the residual oil taste. Add the fact that the prawns were crunchy made it all the better, especially with a dollop of mayonnaise. Steamed Beef Balls - I personally didn't quite take to the beef balls even though I'm a fan of beef. It lacked that beefy punch (bland!) and the texture was rather soft. But on the upside, I did like the addition of water chestnuts for that extra crunch. 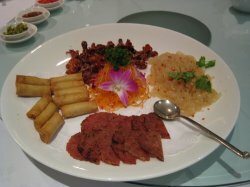 Meat Platter -Our meat platter consisted of roasted pork, BBQ pork and roasted duck. The roasted pork skin was crispy to a fault and evenly salted with an excellent fat to meat ratio whilst the BBQ pork sported a nice sheen over rather lean meat that didn't come across as too sweet. On the other hand, the roasted duck was a tad dry but compensated a little with its crisp skin. 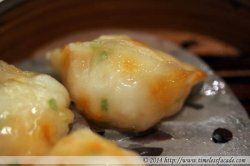 Steamed Prawn Dumpling - The ubiquitous dim sum dish; har gao (虾饺). Translucent skin with a wee bit of elasticity enveloping a chunk of crunchy prawn. What's not to like? Steamed Custard Bun - With a semi sweet molten center and nuances of saltiness all wrapped up in a reasonably delicate bun, the steamed custard bun was a nice sweet treat after all the preceding savoury ones. BBQ Pork Bun - One of Wah Lok's signature dishes and one of my personal favourites as well, the BBQ pork bun sported a crusty sweet top with delectable morsels of BBQ pork cocooned in a soft and warm bun. Very good! Baked Custard Pastry - Another one of my favourite dishes, the 美人腰 was obviously over baked this time round, as evident by the burnt nuts. 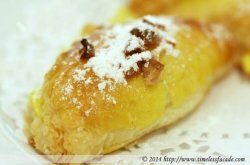 But the pastry was still flaky and the custard filling, smooth and sweetly satisfying. Dim sum for the 4 of us cost about $125, which isn't too expensive for the quality that Wah Lok offers. It is heartening to note that Wah Lok has managed to maintain its consistency even as competition heats up and traditional rivals (ie. Royal China) have fallen by the wayside. ohmygosh. this must be one of the most decadent chinese lunches i've ever eaten!! hahaha. i felt like i was eating some sort of wedding dinner-esque kind of lunch. no need for introductions here. 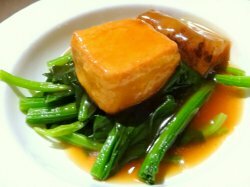 it is WAH LOK CANTONESE RESTAURANT in carlton hotel. okay fine, i should probably introduce it a little since they were so nice to us (: (: wah lok is one of the pioneers to introduce authentic cantonese cuisine into singapore! the plush opulent interior can be likened to stepping into one of those grand chinese palace dining rooms. we felt like royalty! 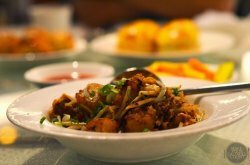 the restaurant is famous for its cantonese dim sum and quintessential, authentic cantonese cuisine. 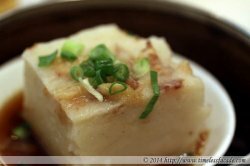 we started off with the bo lo bao, which is one of my favourite dim sum dishes. the bun was soft and fluffy with a thin delicately sweet crusty top which broke easily when we bit into it. the charsiew inside was simply delicious, very soft, with just the right amount of fat and lovely sauce, such that it melted in the mouth. the next dish, braised shark's fin wrapped with egg white dumpling in superior soup was probably the most interesting sharks fin dish i've ever tasted! 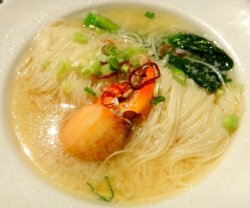 for the first time, the shark's fin wasn't found inside the soup itself! the soup was a heartwarming thick chicken broth that was fragrant and tasty. 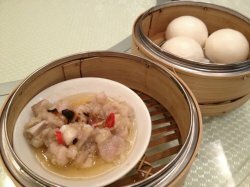 the shark's fin was encased in the thin egg white dumpling, and mind you, it was a very generous amount of shark's fin! 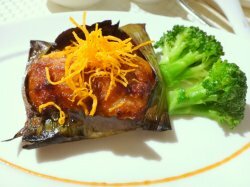 the baked cod fish wrapped in banana leaf with chef's sauce is one of the best fish i've ever eaten!!!! the fried rice with diced preserved meat was so fragrant, that once it arrived at my seat, the flavour just wooshed into my olfactory senses! haha i'm trying to sound cheem, but i think i just failed. anywayyy, it tasted as good as it smelled. every mouthful of rice was full of the lovely aroma and flavour. it was just delicious! It was my first time trying at Wah Lok. Located at Carlton hotel, I about them having some awardss but have not really had the opportunity to try their Dim Sums. Heard that their carrot cakes are unique different from other places. It definitely is, it came in a bowl. 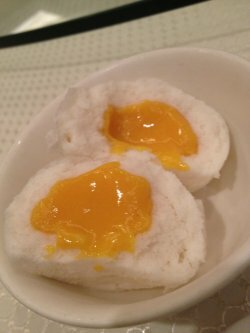 I ordered quite a number of dishes including other dishes such as Liu Sha Bao (Salted Egg Custard Bun). Char siew pork bun, Siew mai (Pork Shrimp Dumpling), Ha gao (Shrimp Dumpling), Pork Ribs, Egg Tarts, Chee Cheong Fun (Rice Noodle Roll), Crispy Skin Roll and some other Dim Sums. My favourite among the rest will be Char Siew pork bun. It wasn’t the typical Char Siew Pork Bun but the Polo Bun kind stuffed with Char Siew. Another favourite will be the Chee Cheong Fun. The skin thickness is just right and not too thick. Generally the Dim Sums here are delicious and fresh. It actually quite affordable though if you order for sharing. I’m certain that if you visit, you will enjoy it as much as I do. Before I start my review, I would like to commend a short-hair female staff named Siew Chin, for her excellent service and impeccable attention to the table. It was rare chance to be served by such a warm and lively lady who always carried a smile on her face and everyone was impressed with the service even though we did not feedback to the management. We were there to have a family dinner and tried some alacarte dishes. I am not a keen fan of expensive ingredients and thus I cannot comment on the taste of some food but those who had them enjoyed the delicacies. Wah Lok restaurant has been around in the Orchard areas for a very long time already. Many regulars, especially the older generations would often patrol this restaurant for a high-tea session as they are quite popular for their Cantonese dim sums. Have tried some of the Chinese dishes during my grand father birthday celebration there. Love their stir fried vegetables with prawns. 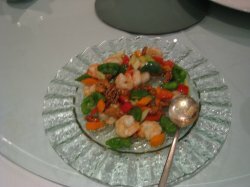 The prawns are fresh and crunchy and are not over cooked. The vegetables are not too oily and crunchy. Portion of their foods are quite alright. Do note the air-conditioner there is quite cool, so do put on more sweaters during your visit. 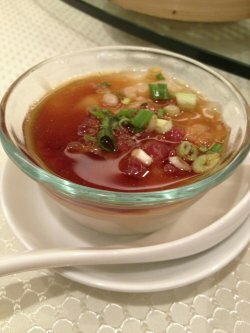 Wah Lok Chinese restaurant has been popular for their Cantonese crusines for a very long period of time already. Happen to go for a friend's wedding dinner at this restaurant and get to try their popular dishes. However the dishes here was not really that generous in portion and the hot dishes was not really serve hot upon arrival on the table. Service here is quite slow and not that attentive. The environment is quite normal with some traditional chinese decoration on the wall. Overall was alright but would really hope that they can try to improve their food standard soon. This is a hong kong restaurant. I most like hong kong diam sum,because it is really nice. 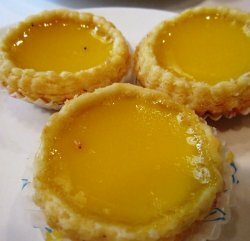 This egg tart is very nice..!the skin is more like many layers,not like the one sell in the bakery. It is very soft and the egg smell is strong. So when bite on it,it melt easily in mouth,and it is really tasty. 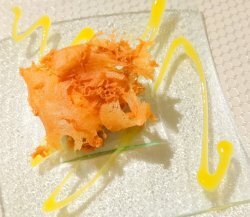 This fried carrot cake is also nice.The carrot cake is very soft and it is quite chewy and wil not stuck in my teeth. The saltiness is just right and it is not very oily too. I like the skin of this dumpling,chewy and soft. I like the freshness of the prawn too.It is really nice. This chee cheong fun is very full of ingredient. The soft and smooth skin covered with the nice ingredient. So when i put one piece in my mouth,my mouth full with the fragrance of the chee cheong fun.It is nice..!!! After the meal,must eat with the nice dessert. Those dessert is really nice. This make my day brighter..! A certain maniacal yearning for dim sum saw me at Wah Lok on a busy Saturday morning, in an attempt to kill off the tiny voice in my head that screamed "dim sum" over and over again. Carrot Cake - Best eaten piping hot, the carrot cake was smooth with bits of pork and shrimp, but not sublime enough with the gravy being a tad too salty. A decent eat nonetheless. BBQ Chee Cheong Fun - Silky semi translucent skin hiding a generous serving of BBQ pork and topped with chives, which gave it a nice contrast and helped cut through the nausea. Nice but best eaten warm/hot as well, lest the skin turns limp when cold. Century Egg Porridge - I'm not a big fan of century egg so I shall reserve my comments save for the fact that the porridge was nicely textured with bits of grain evident. 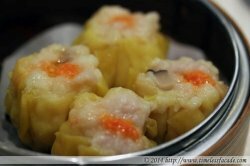 Pork Dumpling - The siew mai hit the right notes with its low proportion of fatty meat as well as a generous serving of relatively fresh and crunchy prawns. Not too salty as well. 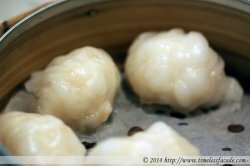 Prawn Dumpling - Another quintessential dim sum staple, the har gao had nice crunchy prawns enveloped in a thin, not too elastic skin. BBQ Pork Bun - Wah Lok purportedly serves up one of the best BBQ Pork Bun aka Bo Lo Bao (波萝包) in Singapore and its easy to see why. A crusty semi sweet top coupled with a nice, almost oozing BBQ pork filling that wasn't cloyingly sweet - No complaints, really. BBQ Pork Pastry - I thought that the char siew sou lacked the buttery goodness in its pastry, something which I personally prefer. But still a notch above most places with its flakiness and not too sweet BBQ pork filling that had nice chewy bits of fat. 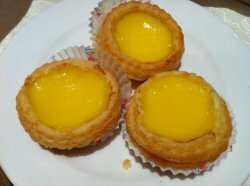 Egg Tart - Flaky pastry with a nice, moderately sweet custard center. Came in a nice bite size as well. Only thing lacking was the butter, in my humble opinion. 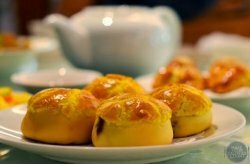 Custard Pastry - The 美人腰 (pretty lady's waist) ended our dim sum session on a positive note with its flaky pastry coated with tons of icing sugar, belying a warm, smooth and mildly sweet custard filling within. A satisfying dim sum lunch cost the both of us about $58, which is very reasonable considering the quality. Wah Lok has managed to maintain its consistency over the years and I am sure I'll be returning for many dim sum trips to come. 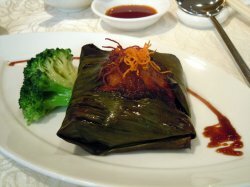 Wah Lok Cantonese Restaurant for lunch with family Their baked cod fish which is wrapped in banana leaf is easily the best dish I had that night! the fish was delicious. The chef sauce on the fish made it even nicer as it is very flavourful. it also had a slightly smoky flavour, and this definitely added a lovely taste to the fish! Yummy! We also bought their egg tarts! Very nicely done! Their baked cod fish which is wrapped in banana leaf is easily the best dish I had that night! the fish was delicious. The chef sauce on the fish made it even nicer as it is very flavourful. it also had a slightly smoky flavour, and this definitely added a lovely taste to the fish! Yummy! 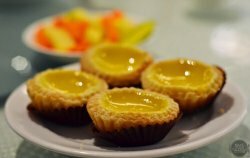 We also bought their egg tarts! Very nicely done! this is my second visit to wah lok. it was for a family gathering. the food is really good, suits the elderly palettes. their stir fry meats and duck was the highlight of the day. it was so nice then even my grandparents sang their praises.